Watching a clown fish and sea anemone living together is fascinating, because most fish simply become lunch! Where are sea anemones found? What do sea anemones eat? Sea anemones have special relationships with other animals and organisms, where each animal helps the other in some way. The incredible relationship between sea anemones and clownfish has long been a fascination to divers, scientists, aquarists, and casual observers. Sea anemones have become favored inhabitants for both the reef tank and the saltwater aquarium. A beautiful clown fish anemone playing host to a colorful clownfish has become a popular reef tank scenario. But the symbiotic relationship between a clown host anemone and its clownfish goes far beyond just a mere fascination. A very happy Clark's Clownfish couple is spawning under a rock near their anemone. The anemone is to the left and the eggs are the reddish orange dots. After the male fertilizes the eggs, they fan the new arrivals. Clark's or Banded Clownfish are readily available, love Bubble Tip Anemones, and are durable fish for the beginner aquarist. Breeding Three-band Clownfish (Amphiprion tricinctus) pair with eggs and they are fanning the eggs. Awesome mated pair of True Percula Clownfish fanning their newly laid and fertilized eggs! Most of the time in open aquariums such as these, the eggs are picked off within a day or so. If wanting to breed your clownfish and develop babies, a 10 gallon tank and a flower pot is all you need! Of course, rotifers and other special foods, as well as multiple water changes daily will ensure success! Slightly pale green Bubble Tip with Maroon 5 host! The Green Bubble Tip is a little pale in this video, however the fact that it is eating means it should intensify in color. They love all marine flesh. In my experience, the green bubble tip do not need as much light as the Rose or Red Bubble Tip, but still need good lighting! A mature tank with good water quality is best for long term survival! The Delicate or Sebae Anemone is one of those sand loving, light sucking, clown hosting prima-donnas of the marine tank. If it is not perfect, well it will just up and die! They need fine sand that is at least 3 to 4" deep to feel secure. They do like to be able to disappear into the sand when frightened or threatened. Without the sand they stress and die. If you want an anemone that stays up in the rocks, you may want to pass on this one. They are beautiful and will host true Perculas as well. Appearance of a sea anemone: Sea Anemones are polyps. They have an adhesive pedal disc or foot used to hold them in place, a hollow cylindrical or column shaped body, and an oral disc, or mouth, at the top which is surrounded by a circle of tentacles containing stinging nettle-cells or nematocysts. These stinging cells are used to capture prey and push it into its mouth. With only a slight touch, the tentacles shoot harpoon-like filaments into passing prey, injecting it with a paralyzing neurotoxin, and then guiding it into the mouth. They have a single body cavity referred to as the coelenterate. It serves as stomach, lung, intestine, and everything else! There is only one opening into this cavity, the mouth, through which everything passes in and out. Where are Sea Anemones Found: Sea anemones belong to the order Actiniaria, and live in all the ocean on earth, ranging from the extreme poles to the equator, and from the deep sea to the shores. However, of the approximately 1,000 known anemone species, there are only 10 types of anemones known to host clownfish. 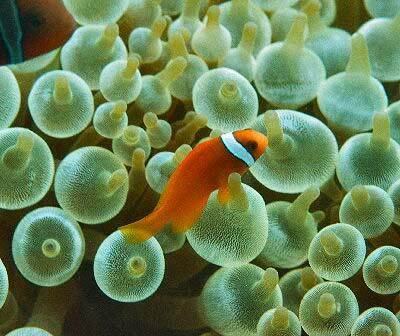 The clown hosting anemones are found in parts of the Indian Ocean and Pacific Ocean where there are tropical currents. Sea Anemone Habitat: The clown fish anemones only exist in shallow waters to depths of 164 feet (50 m). They will inhabit coral reefs, but are also found on sandy surfaces, in seaweed ‘lawns', and on muddy surfaces near a reef. One of the reasons clown host anemones live in shallower waters is because of their symbiotic relationship with a marine algae called zooxanthellae. Once established, many types of anemones are known to be quite hardy. However many anemones simply do not fare well in captivity. Much of their demise is attributed to the difficulty in the collection and handling of these delicate animals, but it can also often be attributed to their care after being obtained by the aquarist. The survival rate of many anemones once they enter into the aquarium industry is very low, particularly among the larger carpet anemones. This is unfortunate as the larger carpet anemones are natural hosts for a number of anemone fish, but fortunately clownfish will take other kinds of anemones as hosts. The best anemone survival rates are with one of the carpet anemones, the Saddle Anemone. Another anemone that is very common and reasonably hardy is the Bubble-Tip Anemone Entacmaea quadricolor. This is fortunate since many different kinds of clownfish will accept the purple base anemone as a host. Color: When selecting a clown host anemone, make sure the color is good. If an anemone is white, it may have released its zooxanthellae that it depends on for much of its food. This can spell disaster over time. Mouth: Make sure the mouth is not loose or gaping open. Tentacles: Look at the tentacles, make sure that they aren't short when they should be long, or not skinny when they should be fat. Foot: Make sure there is no damage or tears on the foot area. This can result from pulling an anemone off its surface. It should be a little bit sticky and should be attached to something. Anemones that are not attached to anything may have trouble attaching. Pick it up: Anemones contract when they feel threatened, make sure the anemone you get reacts when it is picked up. Transferring an Anemone: To take a clown host anemone from another aquarium, use a thin blunt item like a credit card and gently wiggle it under the foot, slowly nudging it away from the glass. If its attached to a rock, ideally you can simply purchase the rock as well. if you cannot purchase the rock then directing water at it or wiggling the rock gently upside down under water while tickling the foot can work. Anemones vary in their aquarium hardiness and difficulty of care. Be sure to learn about the type of anemone you want so you can determine its needs and its suitability for your aquarium. It is also important to choose an anemone that is suitable for your aquarium type. Most types of anemones do well in a reef tank, but there are a few that are better kept in a saltwater aquarium rather than a reef environment. Types of anemones: Of the 1,000 known types of anemones, there are only 10 species of sea anemone that are known to host Clownfish. The 28, closely related species, of clownfish from the genera Amphiprion and Premnas are found to inhabit only these 10 sea anemones. Unlike their clownfish partners, these 10 symbiotic anemones are not closely related. The Actiniidae family is the largest and best known family of anemones. It includes the most common anemones, the temperate water anemones, and the shore anemone species; but most members in this family don't host clownfish. As a matter of fact, because many members in the Actiniidae family inhabit cold-water regions, clownfish simply don't exist there. The Stichodactylidae family is a family of large anemones or carpet anemones found only in the tropics. The Thalassianthidae family contains four genera including Cryptodendrum, Actineria, Thalassianthus, and Heterodactyla. They can also be found in the tropics, but only one species in this family hosts clownfish. Zooxanthellae: Zooxanthellae are photosynthetic organisms contained in the anemones tentacles. Zooxanthellae require light to carry on photosynthesis, so must be in shallow enough waters for the light to reach them. The zooxanthellae are generally a light brown color. The loss of zooxanthellae, apparent by a whitening of the anemone, usually means the anemone will slowly grow smaller and smaller until it dies. What do sea anemones eat: Waste products produced by zooxanthellae are a primary food source for many anemone species. Zooxanthellae provide sufficient energy for clown host anemones to survive; however in order for them to grow and multiply, they also require animal foods. They have no need to actively hunt because like all sea anemones, they use poison in their tentacles to catch prey. Food in the form of plankton is brought to them in the current. Other meaty foods include small fishes, sea urchins, mussels, worms, shrimps, and other crustaceans. Sea anemones wait for prey to swim by, then sting and ensnare it with their tentacles, and finally guide it into their mouth. Sea anemones life cycles: A small anemone is no indication of its age, as they can only grow when they receive good food. When there is a shortage of food they will shrink. How long an anemone will live is unknown. Studies have shown that sea anemones can live for decades if not centuries. One specimen in New Zealand is said to be possibly be more than 300 years old. In captivity some anemone species have been known to last 80 years or more.